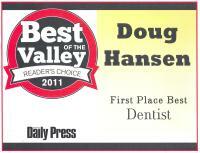 Dr. Hansen, Dr. Amundson and Dr. Horkan have nearly 50 years of combined experience in comprehensive Dental care. We strive to provide our patients with the highest quality dental care in a timely manner using state of the art techniques. Our treatment is accomplished with the patient?s comfort in mind by a friendly, caring, well trained staff. Our primary goal is to help our patients achieve optimal oral health as an important part of their total body health. Located in beautiful Montrose, Colorado at 629 E. Star Ct., near the Star Drive in. We look forward to seeing you soon!